I saw my very first Cackling Geese on Friday September 20 while on an outing with some of the members of a bird-photography course that I am taking. We were at our last stop of the day which was Sardis Pond which sits in the middle of Sardis Park in the middle of Chilliwack. My one previous visit was in late May when the bird population consisted of small numbers of Canada Geese, Mallards, Red-winged Blackbirds and a few Wood Ducks. Later in the year, I was told, the pond would get more interesting as a lot more birds move in for the winter including thousands of Canada Geese and, in recent years, a small of population of Cackling Geese. The photography instructor Ken, with his black-belt in camera skills, thought it worth making a quick stop to look for early cackler arrivals before calling it a day. We weren’t disappointed. The first thing that we noticed was the large number of Canada Geese that had already moved in. We estimated that there were probably 800 to 1000 of them. Canada Geese have taken over in Sardis Park. Can you spot the two Cackling Geese? After a few minutes of searching, Ken found 2 cacklers hanging out together and, over the next half hour or so, we took a whole lot of pictures. That might have been the end of the story that would have ended with a checklist indicating two Cackling Geese. However, Ken noted a partial white neck ring on one of the two geese and we weren’t sure if it was significant. When I got home I took a closer look at both and wondered if they might be from different sub-species. 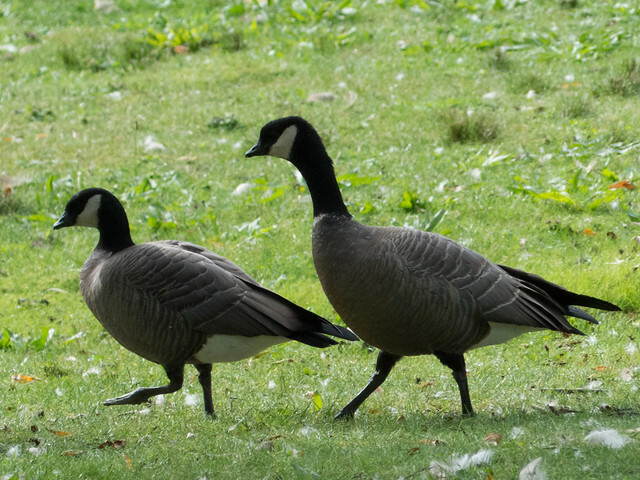 This led me on a path over several days that would introduce me to the many of the pitfalls associated with bird identification – in this case, the attempted identification of the specific sub-species of the two Cackling Geese. The process of trying to identify the subspecies for the 2 geese was quite educational and I decided that it was worth describing in some detail along with some lessons learned drawn from some identification mistakes made along the way. During this process, I was quite glad to have taken a large number of pictures of the two cacklers (over 50) as well as a short minute long video. The following picture shows the 2 cacklers side-by-side. The bills on each bird look similar in size and shape and definitely have the expected stubby form of the Cackling Goose . The bird on the right appears slightly larger, has a squarer head and a partial white neck ring. 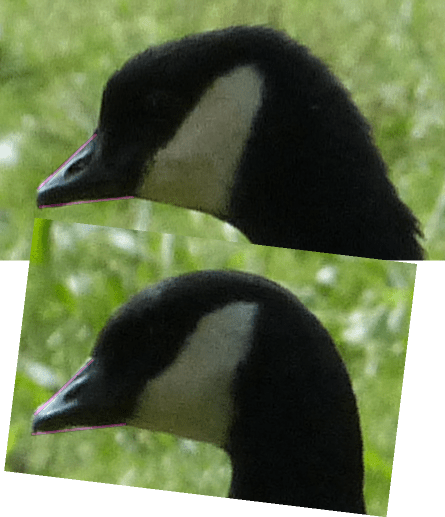 While you cannot see it in the first image, the second image shows the larger cackler (now on the left) to have a noticeable throat stripe not present on the smaller goose. Two cackling geese from behind. Note the throat-stripe on the left bird. The third picture, below, shows the two birds head on providing a good look at the colour of the breast. Both geese show a fairly dark brown. The size difference is also less noticeable in this view. My usual first stop for bird identification is The Sibley Guide to Birds. My hard copy only lists Canada Goose since the Cackling Goose was only split from the Canada Goose into its own species in 2004 (in the 45th Supplement to the AOU Checklist of North American Birds to be precise). The online version of the Sibley Guide on my iPhone and iPad is updated regularly and does the 2 species though does not contain the level of detail that would eventually be necessary. Another extremely useful guide that I consulted extensively was the online Sibley guide: Distinguishing Cackling and Canada Goose. Finally, I relied on expert help from the Fraser Valley Birding forum to make up for my own lack of field experience in the fine details and the pitfalls of separating subspecies..
B h minima: The ‘Cackling’ Cackling Goose and the smallest of the cacklers. It is described as having a round head, short bill and dark brown breast with a purplish tinge. B h leucopareia: The ‘Aleutian’ Cackling Goose. It has a dark brown breast and is slightly larger and has a squarer head than B h minima. Usually has a white neck ring and usually has a black neck stripe. The bill is longer than that of B h minima as well. My first thought was that the smaller goose was a B h minima while the second had characteristics suggestive of B h Leucopareia (neck stripe, partial collar, squarer head, larger size). However, there were several issues with the larger bird being a B h Leucopareia. First, the breast colour of both birds was very similar having the purplish sheen described for B h minima. Second, the collar should probably have been a complete collar and not partial as seen. In any case, both collar and neck stripe can occur on other subspecies and cannot be reliably used for identification according to the online Sibley guide. If you read the entire online Sibley guide you will find some suggestions as to how to find Cackling Geese in a crowd of Canada Geese. First, they suggest looking for birds that group together as a good way to identify birds from the same family group or population. These 2 geese that we were following were definitely sticking together. Since male geese are typically larger than females, this could explain the size difference. The difference in head shape is a little problematic as I do not know how important that trait is for a positive identification. Reference  suggests that head shape is not a critical trait and should not be a primary consideration in identification. A good method of separating a Cackling Goose from a Canada Goose is to look at the bill size. This can also sometimes be used to separate subspecies in as well as is the case with B h minima and B h Leucopareia. The online Sibley guide has a table showing the range of bill length for the different Cackling and Canada Goose subspecies. In particular, there is no overlap between B h minima and B h leucopareia. Measuring the exact bill length is not practical however all we really need to compare is the relative bill size. Consider the first picture of the 2 Cackling Geese walking single-file. 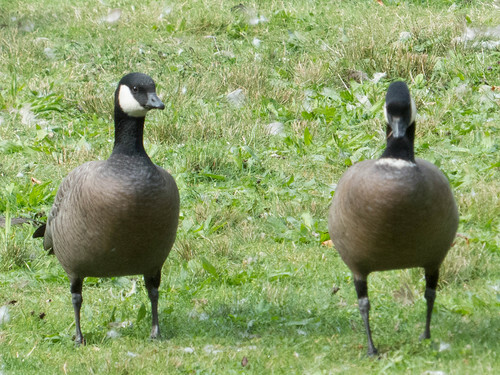 Both geese have their heads pointing in the same direction and are roughly the same distance from the camera. The following image shows only the heads of the two geese rotated such that their bills have the same orientation. I marked the upper and lower edge of both bills with pink lines that have the same length and orientation on both birds. 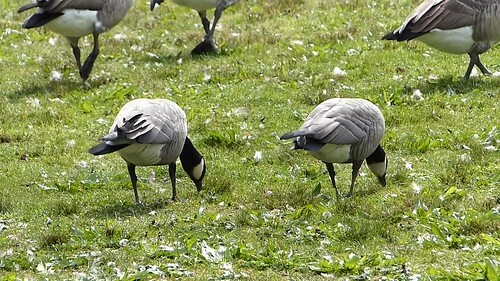 Their bills are effectively the same length which, according to Figure 2 in Sibley’s Guide is strong evidence that if the smaller goose is a B h minima then the larger bird should be as well. The following image shows the re-oriented heads for the larger cackler and one of the large Canada Geese that were present at Sardis Pond and that I captured in a picture where their heads were pointed in the same direction and where both were roughly equidistant from the camera. A pink line on the lower bill shows my estimate of the bill length for each with the length in units used by the program that I used to manipulate these head shots. The resulting Canada/Cackling bill length ratio is about 1.74. 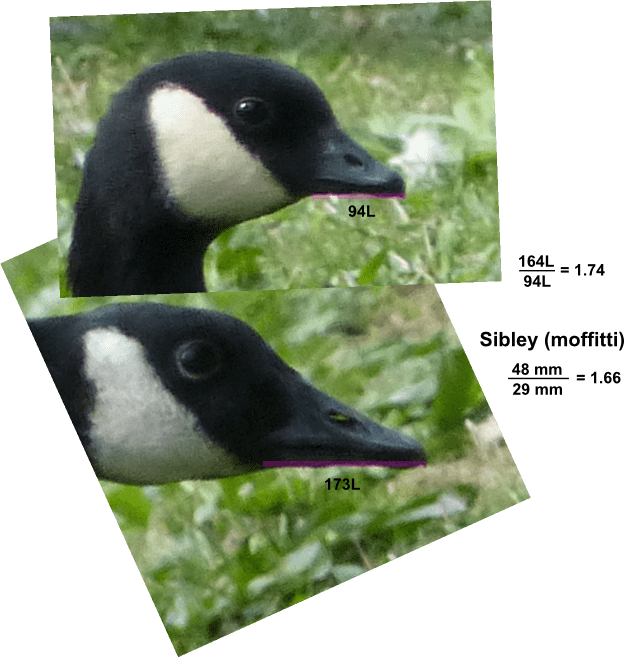 If I assume that the Canada Goose is of the western moffitti subspecies that is common in the west then, from Figure 2 in the Sibley Guide the expected ratio would be about 1.66. The evidence suggests that both of these cacklers were of the minima subspecies. Seeing a new bird is always satisfying. Being given a challenging puzzle to determine the subspecies was, in many ways, even more satisfying than the new life-list check-mark. I certainly learned a lot more about the pitfalls of bird identification. In fact, I’m still a little worried about that not-so-round head on the bigger cackler so maybe this story is not over yet. One of the big lessons learned for me was that taking lots of pictures is a good thing, even after I had several good ones to document the new species. Thanks go to Ken for spotting the pair of cacklers, to Gord for correcting some of my identification missteps, and finally to Sibley for the excellent online guide. Sibley Guides: Distinguishing Cackling and Canada Goose. Stokes Birding Blog: Cackling Geese subspecies in the East. Monterey Birds: Canada Goose and Cackling Goose. This entry was posted in Identification, Research, Species and tagged Bird Identification, Cackling Geese, Canada Geese, Chilliwack, Sardis Park, Sardis Pond, supspecies on 2013/10/29 by KevinHHood.